There are many functions within Password Safe that can be adapted to the needs of users. It is also possible to define various parameters for optical representations. This can be inherited both at * user level *, * global * and * organisational units *. In addition, there is a security level concept, which categorizes the users into five layers. The administration of settings can thus be linked to the presence of the required security level. You can configure user settings similarly to user rights. Here too, there are a total of three possibilities with which a user can define his settings or be configured from another location. For the sake of easy manageability, it is again a good idea to configure the users not individually, but to provide several equal users with settings. Personal settings only apply to a specific user. These are always configured via the organisational structure module. Global settings apply to all users of a database without exception. You can configure them in the client settings. 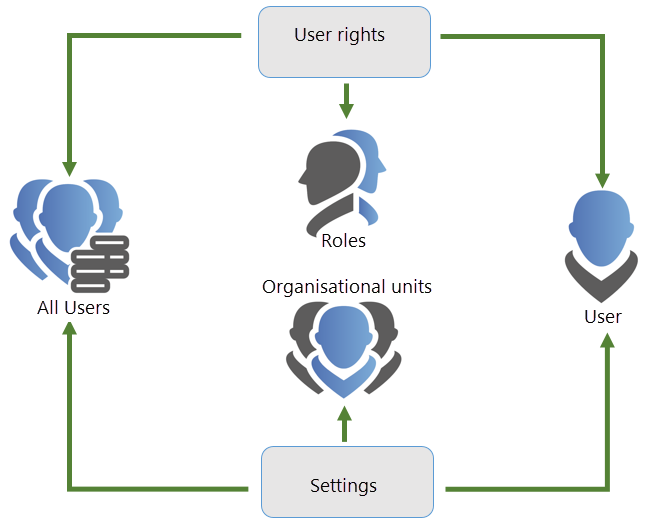 !In addition to personal and global settings (as opposed to authorizations), settings are not assigned via roles, but via organisational units! 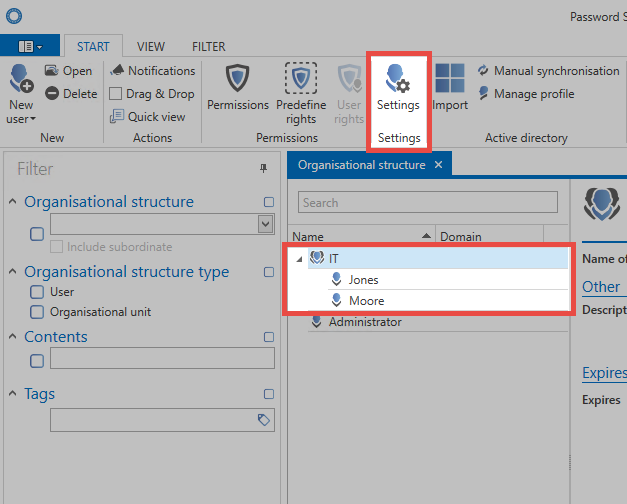 The “Settings” button in the ribbon allows you to see the settings for both organisational units and users. The many setting options can be restricted by the known search mechanisms. The diagram shows the settings for the user “Jones”. The search has been filtered by the term “Detail”. The column “Inherited from” shows that some settings have been inherited globally, or by the organisational unit “IT”. The top two options have no value in the column. This is because this parameter has been defined at user level. *The inheritance for individual settings can be deactivated in the ribbon! 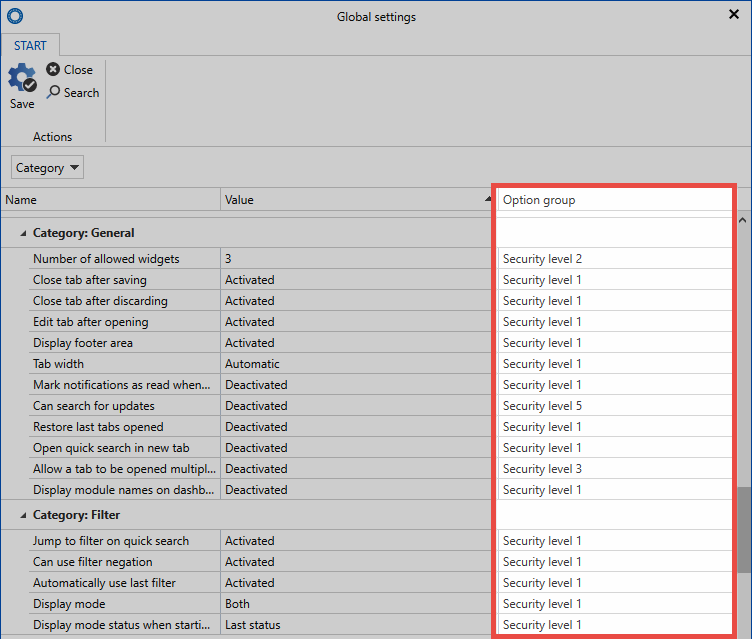 Option groups were created in the global settings to ensure that users can control only those settings for which they hold permissions. 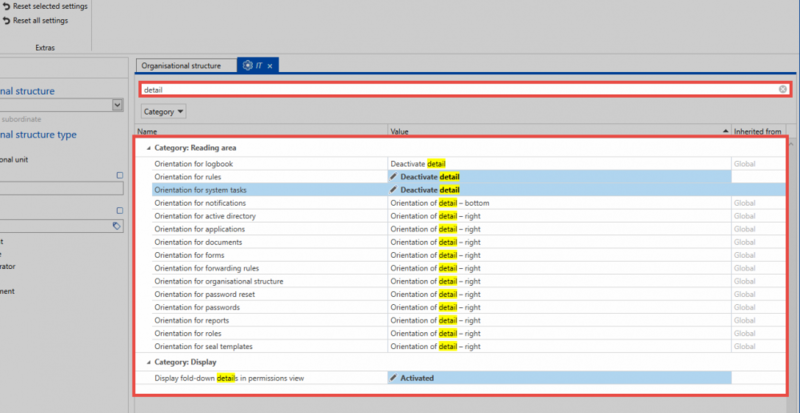 Categorising security levels from 1 to 5 allows you to combine similar options and thus make them available to the users. 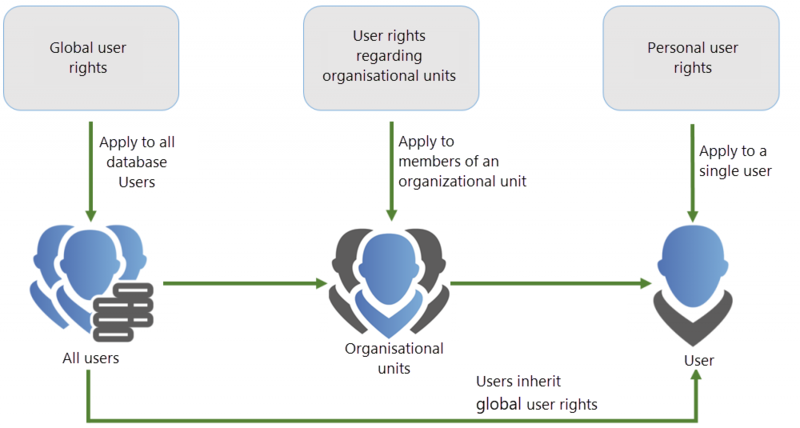 The user rights define who has the required permissions to change which security levels. As with all rights, this is achieved either through global inheritance, the role, or as a right granted directly to the user.